Over one hundred years ago, a work of Christian outreach began in the Lowtown area of Bridgnorth. 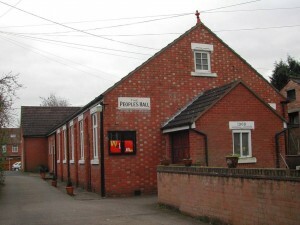 Having started its existence as the Bridgnorth Early Morning Adult Sunday School, it eventually became what we know today as the People’s Hall Evangelical Church. A group of Christian men had already been in prayer, having recognised the need in Lowtown for a place of worship and a means of reaching the local people with the Gospel. Their prayers were to be answered when an approach came in July 1903 from Edward Smith who was the President of the Midland Adult School Association. The cause was taken up by Edmund Eliot Lowis, assisted by Frank Berwick Foxall and other like-minded men. Premises were found for rent and the first meeting of those interested took place on 31st October 1903. I confess my heart sank when I stumbled through a dark room on the ground floor, up a ladder that led through a hole in the floor into a loft hung with cobwebs, dirty to the last degree, and with apertures for windows hung with old sacking, the whole pervaded by a very strong smell of the artificial manure that at one time had been stored there. We borrowed a table, one chair and a lamp, the sickly light casting ghostly shadows, and giving a queer sense of unreality, as about forty men stood or leaned against the wall, while Mr Lowis as chairman made his first suggestions for the men’s consideration. In the midst of those inauspicious circumstances the Bridgnorth Men’s Adult School was begotten. The very first early morning meeting was held on 3rd January 1904, attended by twenty men. The purpose was for men to gather for instruction and discussion of the Word of God. Very soon it expanded to include a junior section, and social activities were taking place for the men every evening. Sunday services were held for their families, and eventually in 1906 a Women’s Bible Class was started in Whitbrook House. A rapid increase in the numbers attending those meetings led to the acquisition of a plot of land in St. John Street and the building of The People’s Hall in 1908. The cause of Temperance was an important part of the work for many years as the consumption of alcohol was seen as a destructive force and a barrier to Christianity. Detailed reports written each year give a wonderful insight into the commitment of those founding members to the Lord who entrusted His work to them. Their depth of faith and trust in Him through good times and troubled times is wonderfully clear. The early reports carry us back to a time when there was a wonderful eagerness to search the Bible and discuss its application to every part of life. Many came to know the Lord through those Bible classes, and some went on to full time Christian ministry. The full story telling of the first hundred years, the influence of Edmund Lowis and Frank Foxall, how the work developed and eventually became a church, is shortly to be published. Details will be given on the website when this is available.